Do you struggle to know when or if it’s appropriate to step in to help a teen who seems stressed, anxious, or depressed? Do you know the signs to look for to determine whether a teen is in distress? 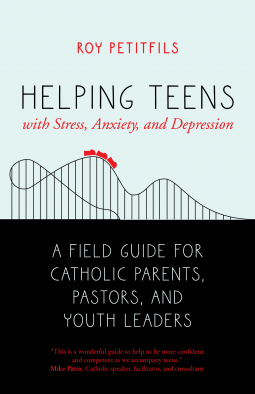 In Helping Teens with Stress, Anxiety, and Depression, Roy Petitfils—a Catholic author, speaker, and psychotherapist—offers his personal experience, advice, and faith to give parents, pastors, and youth leaders the knowledge, courage, and tools they need to step in, make a difference, and be the presence of Christ for teens in crisis. Roy Petitfils knows what it’s like to be an addicted, depressed teenager, filled with self-loathing and desperate for help. He describes himself at high school graduation as by far the largest person in his hometown and yet feeling as though he were “stuck in Harry Potter’s invisibility cloak.” Weighing more than 500 pounds, he was addicted to food and hated himself. Now a leading Catholic voice in youth advocacy and creator of the popular podcast Today’s Teenager, Petitfils entered adulthood a very different person than he is today. His life was radically changed by a handful of people in college who reached out in friendship and helped him set a new course. Using personal life lessons and expertise gleaned from more than twenty-five years in youth ministry and private practice as a licensed counselor, Petitfils teaches parents, pastors, and youth leaders what they need to know about mental health issues among America’s youth. Whether teens need help coping with healthy levels of stress or face persistent, more serious problems with anxiety and depression, Petitfils will help the adults in their lives get comfortable with stepping in. He explores the support and comfort available through the sacraments, Catholic devotions, different forms of prayer, and reading the Bible. Ultimately, Petitfils identifies how to gently, yet persuasively guide hurting young people to deeper trust in the tender mercies of God. Roy Petitfils is a Catholic author, speaker, and psychotherapist in private practice. His books include What Teens Want You to Know (But Won’t Tell You), What I Wish Someone Had Told Me About the First Five Years of Marriage, God Wears Running Shoes, and A Practical Guide to High School Campus Ministry. Petitfils has more than twenty-five years of experience ministering to youth and young adults in parishes, dioceses, and schools. He has spoken to youths and adults in more than seventy-five dioceses in the United States and Canada, and has given keynote addresses at numerous national and regional conferences, including USCCB Convocation of Catholic Leaders, NCCYM, and NCYC. Petitfils also spoke at TEDx in 2016 and is host of the popular Today’s Teenager Podcast. He has a bachelor’s degree in liberal arts from St. Joseph Seminary College. He did graduate work in spirituality and theology at Pontifical University of St. Thomas Aquinas and earned a master’s degree in community and school counseling from the University of Louisiana Lafayette. I work at a middle school and found this book to be extremely helpful, as it is sometimes hard to navigate when and if to step in with students that are struggling.